I do have a wonderful recipe to share with you. My friend, Sandy, gave me a Crock Pot recipe for very easy Chicken Tortilla soup a few months ago. It was delicious, but I wanted more veggies and spices, so I researched several other recipes, took what I liked, and gave the new concoction a whirl last night. OMG! I think I have a real winner here! My husband said it was the best Chicken Tortilla soup he's ever had....and I think I agree! Best of all, it's made in the Crock Pot and is a "dump it in - walk away" kind of recipe. Click here for the recipe if you'd like to give it a try for yourself. Oh.....and last call for anyone who would like to send me a photo of your Quilty License Plate! Thanks so much for stopping by to visit with me today! Next time, I should have something a whole lot more fun to share with you! ﻿﻿﻿﻿﻿﻿﻿﻿﻿ I'm completely in sewing and designing mode these days. I feel the pressure of Spring Quilt Market bearing down on me already. It will be here before I know it. My to-do list is long and the days seem so short. I have many fun things planned this spring and they have been ruminating in my mind for quite awhile now. I think this phenomenon happens to all of us, no matter what we do for a living. There's just always so much we want to do and so little time. I think if you love the needle, then it's part of your life....this want (sometimes need) to make many projects. So what if we'll never live long enough to complete them all! It's a life of happiness with never a dull moment! I wouldn't have it any other way!! Presently, I'm getting ready to start another quilt, and I'm not quite ready to take pictures to share with you......so, I thought I'd share some wonderful quilts that are done, finished, quilted and bound. Don't forget to email me a photo of your Quilty License Plate!! I'll be posting the photos very soon. Join Lynne Hagmeier and me as we cruise to Alaska on The Great Girlfriend Get-Away! Click here to find all of the details! Ta Da! Here's the finished schoolhouse quilt. Just four blocks and some Flying Geese. When paired with great fabric can really make a graphic statement.﻿ Simple is good. It was great fun to make and went together easily. I decided to name it Little Red Schoolhouse. We have a Little Red Schoolhouse petting zoo not too far from here, and its been there for as long as I can remember. I do recall going there on a grammer school field trip - which was a very long time ago! We'll just leave it at that! The top is now at the quilter and I have no idea what designs she'll be doing. When it's finished, I'll post another photo. The pattern will be available soon. Oh, and by the way.....for all of you Prairie Women out there.....this block will be featured in a Journey 4 quilt, so stay tuned! Here are the four blocks for the new quilt I'm making. Yup - just needs four blocks! I love a schoolhouse block. I designed this one to be very simple - no templates needed - no Y seams! I think they're so cute in red, but would be lovely in any color. Hhhmmmm.....perhaps blue? I'll post a photo of the finished quilt as soon as it's done. It is not part of the Prairie Women's Sewing Circle club, but will be a new Vintage Stitches pattern. I haven't decided on a name just yet. Any suggestions?? 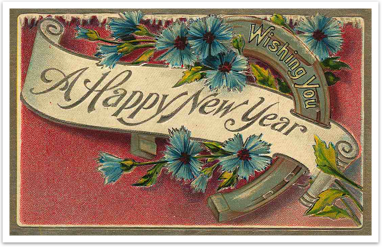 Check back soon and enjoy your day! Now that all of the Christmas decorations have been put away and the house is back to normal, it was time to start a new quilting project! Do you feel the same way, too? I have several "in the works", and chose to start with the one using The Cotton Club fabrics by Paula Barnes for Marcus Bros.
Aren't they just as yummy as can be? Check back with me in a few days to see what I'm doing with them!! In my post about reading The Kitchen House, I asked if any of you could recommend other good historical fiction books. I wanted to follow up with you with all of the great book recommendations you shared with me. Thanks to everyone who commented, giving us more great reading material! If you know of other historical fiction books you'd like to share, please comment or email me. and husbands joining us!! We're absolutely delighted!! Lynne and I are brainstorming ideas and have fun plans for you! It's not too late to sign up! We'd all love to have you join us on this fun adventure. And....we're planning more cruises for 2013!! 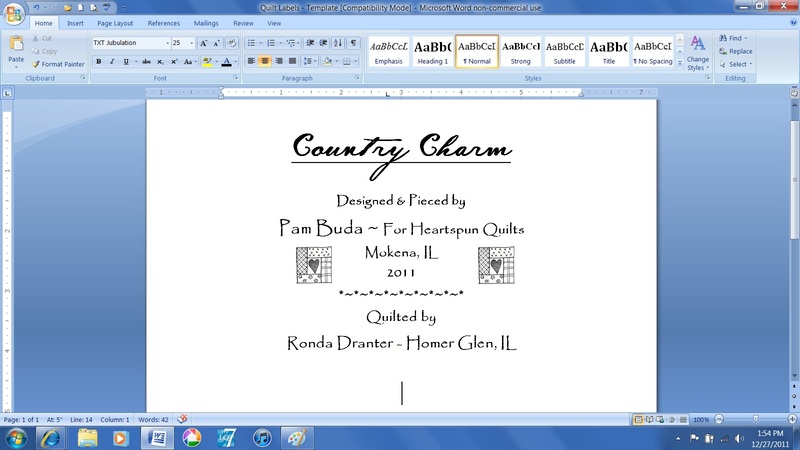 Ready for more quilt label ideas? I really like framing my label with fabrics from the quilt top. You can scrap them up, or just use one...the choice is yours. Often, I make that choice after seeing what's left over. I also take into consideration what fabric I'm using for my backing. I definitely want the frame to stand out in contrast of the backing fabric. Sew strips to the top and bottom, then the sides. You can also sew them Log Cabin style, too. I have an easy and precise method to turn the edges under, which gives the frame a fold and a nice finish, and keeps the corners nice and square. At this point, you can sew the label by hand, or by machine. I prefer to sew the label to the backing by machine. With this method, we don't have to piece the label into the backing, which is a lot more work! It's easily sewn on top of the backing, and the folded finished edge looks great. It will be quilted right into the quilt, too. If you have finished quilts without a label, this technique works beautifully for that as well, because you can prepare the label, then hand stitch it to the backing. All of the details about this technique are in the Heartspun Quilts Hints book, including the strip measurements for two different sized labels (large quilts and small quilts), the turning technique, label placement, and machine stitching hints and recommendations...all with step-by-step instructions and graphics. ﻿To see a full description and/or purchase the Hints book, click here. To purchase the heavy duty freezer paper, click here. Here's a few photos of how the labels look once the quilt is finished. You can certainly use the framing technique with a label you've created by hand as well. The sky is the limit as to the creative things you can do with your label. Add things like pieced units in between the label and the frame, signatures, and trace designs from other sources. Most of my quilt labels are short and sweet, containing only the basic information about the quilt, but sometimes, your labels can be full of details and tell a story. The label above was made for a quilt called Scattered Leaves, which was featured on the cover of American Patchwork & Quilting magazine (October 2009). (The quilt was originally named Waltzing Leaves, but was renamed for publication.) When making this quilt, I enlisted the help of two of my best friends (and their fabric stash!). We each made enough blocks for one quilt, and then exchanged blocks, which also gave us a wider variety of fabrics. Always a good thing! I wanted to tell the entire story on the label, and embellished it by tracing pumpkins and leaves in keeping with the fall colors and motif. The label was featured in another issue of AP&Q as part of an article all about quilt labels (December 2009). No matter what technique you use, it's important that each and every quilt has a provenance. It's our opportunity to say to our future generations.....Remember Me! If you own even one antique quilt, I'm sure you wish you knew all about who made it, where she lived, and what year was it created. Was it made for someone special? What inspired her fabric and pattern choices? Oh, if only those quilts could talk! It is our duty to be sure that our quilts can talk for us long after we're gone, by making sure we have attached a quilt label. I know this is hardly breaking news to you, but so often, we just don't get around to seeing to that last detail.....right? About five years ago, I made a commitment to attach a label to every quilt, which is especially important for the quilts I create for my pattern company. Often, those quilts travel in a trunk show to shops all over the U.S., so it's important they have a label. It's equally important that the label be quilted right into the quilt, making it nearly impossible to remove, not just sewn to the back after it's been quilted. The only thing is......once the quilt top has been pieced, I just don't have it in me to piece a label into the back. I know I should, but I just don't. So...I came up with the following solution. Here's an overview of how I create my labels. Complete step-by-step instructions are available in my Hints Book. I create the label itself using my computer and ink jet printer. (Do not do this if you have a laser printer!!) It's very important to me to be able to create the label using fabric that matches the other fabrics in the quilt. I don't care for the pre-made label fabric sheets you can buy for this purpose because they rarely match the quilt, and are rougher and thicker than the beautiful cottons we piece with. I have a stash of assorted tone-on-tones just for labels. The fabric needs preparation and freezer paper before going thru the printer (info in the Hints book). I have used ordinary freezer paper, but of late, I prefer freezer paper sheets. They are already 8.5 x 11 inches, and are much heavier that kitchen freezer paper, so they hold up better in the printer. Once the fabric is prepared, we're ready for the printer. I create my label as a Word document. Use assorted fonts and clip art to dress things up. (This technique is not for photo transfer!) If you're creating small labels, you can fit two on an 8.5 x 11 sheet. Once you're happy with the label information, load the fabric in your printer, take a deep breath, and hit print! 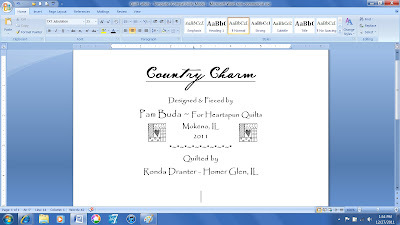 You'll find lots more infomation about label fabric preparation, setting the ink, trimming your labels, etc, in the Heartspun Quilts Hints Book, which is loaded with lots of good hints, tips and tricks about everything quilting! ﻿To see a full description and/or purchase the Hints book, click here. To purchase the heavy duty freezer paper, click here. My next post will give an overview of how I frame and finish my labels, with photos of several completed labels quilted into the backing, including one that was featured in American Patchwork & Quilting magazine! and happiness to each and every one of you! Methinks it is a token of healthy and gentle characteristics, when women of high thoughts and accomplishments love to sew; especially as they are never more at home with their own hearts than while so occupied.